Bed-sharing With Your Pets: Yes or No? Co-sleeping is a hot-button topic these days, but it’s usually discussed as a parenting issue. What about sharing your bed with beloved pets? This way less controversial than mothers sleeping alongside their children, and is something that is usually treated as a matter of personal preference. However, the sheer amount of people affected by multispecies co-sleeping should be an indicator of just how significant this is in terms of human sleep health as a whole. Take a look at the numbers: As of 2017, 68% of US households include one or more tamed animals; and two thirds of these households are home to dogs and cats, the usual suspects when it comes to pet-and-owner co-sleeping. A whopping 60.2 million homes have one or more resident dogs, and about 47 million are shared with one or more cats! A 2015 poll shows that over 70% of American pet owners allow their pets to sleep in bed with them. That’s a lot of sleep being influenced by a fondness for furry friends. Should pets be allowed to sleep on your bed? The short answer: No—but there’s a good chance that pet owners will allow it, anyway. Pet owners, we know that you love your fur babies. We know that you don’t feel like your dog or cat is affecting your sleep. Some studies even support this notion, although they do verify that sleeping without a pet on the bed is still better for sleep efficiency. Allow us to present you the facts, at least—and know that this is coming from people that have pets, too. All we ask is that you be aware of what sleeping with your pet on the bed really means for you and your health. There are many great things about being a pet owner! Humans can form strong emotional bonds with animals, especially ones that can be kept indoors; like dogs and cats. Even simply being in the same room as an animal you trust can relieve anxiety and stress, decrease heart rate, and lower blood pressure; some studies even go as far as to ascribe mental, physical and social health improvements to regular pet interactions. It is important to note, though, that you don’t have to allow your pet on the bed for these advantages to come to the surface. In terms of benefits that come solely from co-sleeping with your pet, there’s the obvious: warmth and comfort. In fact, common Australian idiom three-dog night refers to a night being so cold that you’d need to share your sleeping space with three dogs to stay warm. This coincides with Aboriginal traditions that see dogs—and dingoes—as sacred spiritual protectors; and even in these contemporary times, there are indigenous families that sleep near their dogs to keep themselves safe from evil spirits or sorcery. Physical protection is also one benefit. It may be largely redundant now and mostly for the pet owner’s peace of mind, but an increased feeling of support and security due to animal co-sleeping nevertheless translates to real positive changes in mental health. How does this happen? Well, maybe history has something to do with it. Sleeping with your pet was once a valid security measure! In the pre-Industrial days of Europe, security could also mean protection from rodents; and being a mouser is something comes naturally to most cats and dogs. Today, even with moderns locks and home security systems, some people still keep guard dogs—though these animals probably just sleep outdoors, or at least outside the bedroom. First and foremost is the fact that allowing a pet into your bedroom will lower the space’s air purity and overall cleanliness. 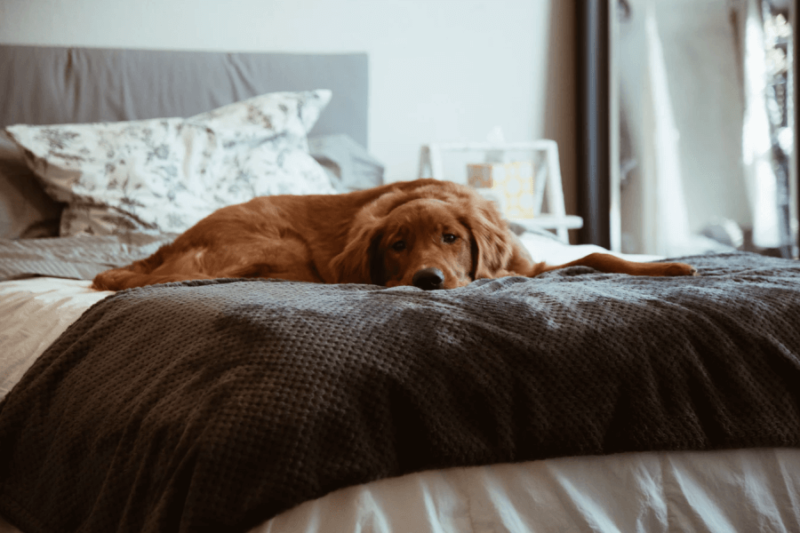 Even regularly groomed and bathed pets may carry dander, dirt, dust and other allergens—such as pollen, and even pests like fleas and ticks—into the house and eventually transfer them onto your bedding. Bacterial and viral contamination is also an issue, but the risk of this is very low; as there are not many diseases that can be transmitted from pets to humans. Another drawback has to do with changes in the relationship between you and your pet, and how that change can potentially effect other relationships you have. Co-sleeping with your beloved dog or cat may be cute and comforting if you live alone; but what happens when you bring home a new boyfriend or girlfriend, and your pet doesn’t understand that they can’t be on the bed all the time or can’t treat new bed partners the same way they treat you? Allowing your pet on the bed can also make for power struggles, as animals may misunderstand co-sleeping as a mark of their dominance in the household. If your pet’s behavior starts becoming more aggressive, or if their separation anxiety becomes worse, it may be time to consider putting a stop to co-sleeping. Finally, we come to the most salient point: More movement means more sleep disturbances, and more of the latter means lower sleep quality. It’s not just a simple case of having more than one warm body on the bed, either. You may think that you and your pet are 100% compatible co-sleepers, but this is not the case. 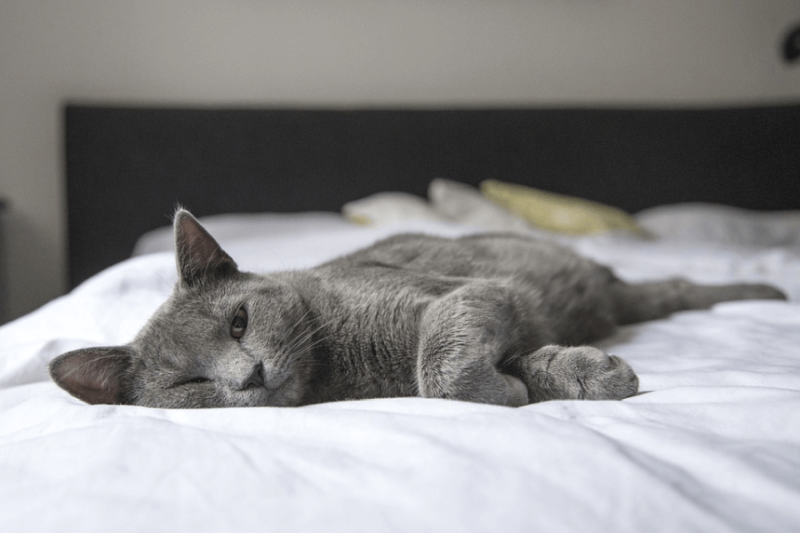 Pets and humans have sleep cycles that don’t exactly match; cats and dogs are polyphasic, which means that they go through the cycle of falling asleep and waking up faster and more frequently than their owners. Cats and dogs are also more sensitive to sound when they’re asleep, and more likely to wake up and move around at the slightest noise. It is an indisputable fact that you will be exposed to less sleep disturbance triggers if you sleep alone. Wondering if the benefits of pet co-sleeping outweigh the drawbacks in your particular case? If we may make some suggestions: Should you already be suffering from sleep trouble or a sleep disorder, please do consult your doctor or sleep specialist about this. Another good idea is to use sleep trackers—for you and your pet; yes, wearable technology exists for our furry friends—while co-sleeping, for evidenced-based assessment of sleep quality. This goes for you and your pet. If, after all of this, you still want to let your pet sleep on the bed, consider bathing and grooming them more than usual. More frequent vet visits can’t hurt, either. More frequent bedding changes, too! And if you notice your pet hogging the bed, snoring, or kicking you in their sleep, do assess the situation objectively. Your need to have your pet close to you is not worth losing precious hours of sleep and rest! 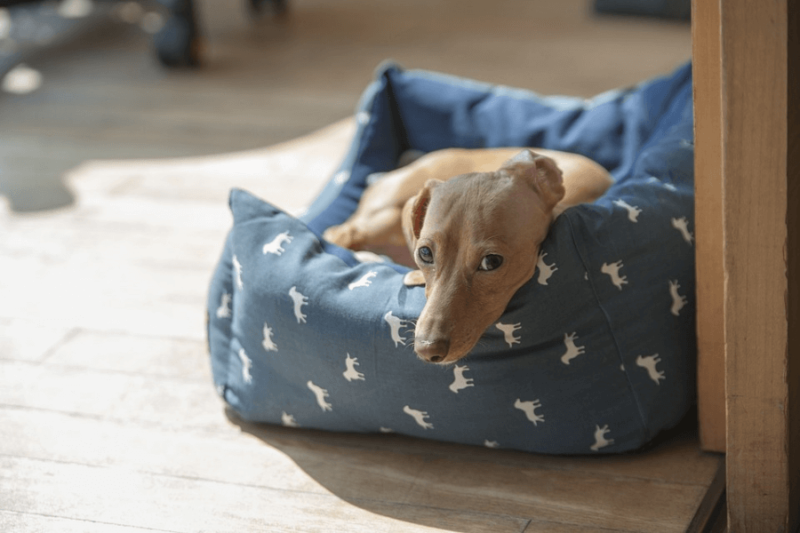 Will it really make a difference if you place a pet bed in your bedroom, instead?